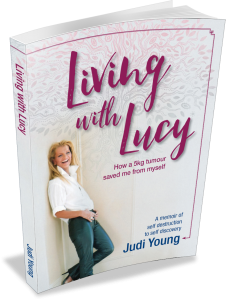 My book Living With Lucy is a transformation story with a twist. When I visited a life coach five years ago I struggled to recognise myself as the same person who was in a photograph that I was showing him. I decided to find out who I really was, but was thrown a curveball when I was diagnosed with cancer. Not only was I reading magazines that were telling me I was too old and too fat, but I was trying to compete with books telling me I should be able to meditate and shrink my tumour in record time. As part of my healing I decided to reconnect with my family, including my 82 year-old uncle who is himself well-known in NZ, being the subject of books and documentaries. I also travelled to India and the Philippines, blundering my way through yoga classes and enemas before realising where my answer truly was. After four years of mishaps and trying every natural healing therapy I could, I had to decide whether or not to have surgery. Timing was important: it took only five years of introspection to be ready! My book started out as a journal of healing, but became something completely different: a book that demonstrates that we are okay as we are. It isn’t easy to stay positive when one is ill; it isn’t necessary to travel the globe to ‘find yourself’ and more importantly, one book cannot have the answers for all people – a ludicrous concept. That is my main message in the book: that as we are, we are okay. It took me a lifetime and a tumour to figure it out. Copyright © 2019 Judi Young. All rights reserved. Join Judi's mailing list to receive the latest about news and appearances.